I honestly don't know where the time has gone; summer is really over, children are already back in school, family outings include apple picking and corn mazes, and that familiar cold nip has returned to the New England air. I find myself sadly saying goodbye to my toes, my summertime companions, that walked with me in the ocean waves, puttered bare around the house with me on lazy afternoons, and never missed an opportunity to look cute in my favorite summer sandals. For now, my tootsies are comfortably nestled in thick, warm socks where they will spend their winter hibernating, only to be seen again next spring. That's not the only wardrobe change that this new season requires. Though I often joke that Maine is one of the only places on earth where you have to wear sweaters all year round, when fall officially arrives, as it has over the past few weeks, sweaters go from being a casual luxury to an everyday necessity. Following the sweater closely on the top list of necessary seasonal accoutrements is the closed-toe shoe, a sensible compromise between the open-toe sandal of summer past and the looming inevitability of the dreaded winter boot. So, in the spirit of looking gorgeous in all types of weather, I compiled a selection of handmade items sure to keep you warmly in fashion. At the center of the color palette for this collection are warm pops of apricot orange and cool, rich charcoal grays. Gilding these plush layers of textiles are just a few Sweet Sincerity designs, including one of my very favorite new designs - the Scheherazade Earrings in Rose Gold Topaz (also available in an Amethyst Luster). I hope you like them as much as I do! 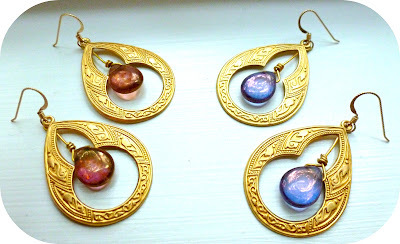 The Scheherazade Earrings in Rose Gold Topaz and Amethyst, available in my shop. My pleasure, you work is a perfect addition. my pleasure. I <3 handmade Italian shoes, but then again...who doesn't? 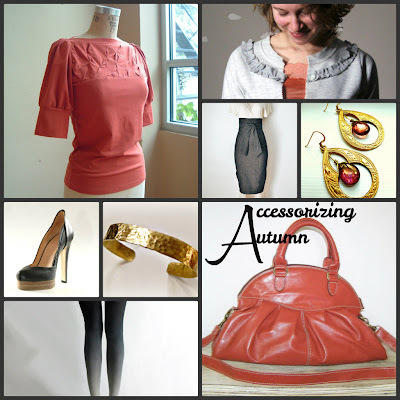 Love the post, thanks for including my top!